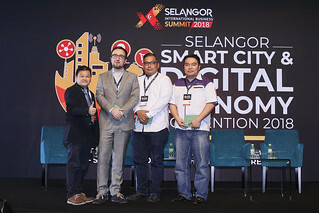 A total following of 100 attendees were gathered at the Selangor Digital Creative Centre (SDCC) for the fifth E-Commerce Class to be held by the Selangor Information Technology and E-Commerce Council (SITEC), titled “EC201: Product and Content Management”. The coach for this session was Sunny Ooi, co-founder and managing director of ClickAsia Malaysia and ClickAsia Singapore. 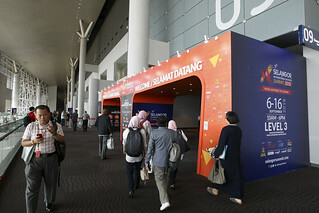 e-Tailer in ICT and lifestyle products with a regional presence, being in both Malaysia and Singapore. For this session, Ooi shared about his own experience in the e-Commerce industry and taught the fundamentals of marketing and content, then delved deeper into product management. Sunny Ooi advocates the use of the 8Ps as a guideline when it comes to planning one’s marketing strategy. “The consumer purchase journey has evolved over the years, and in the new age of shopping, the online model will complement the offline model through the omnichannel model,” shared Ooi, explaining the phenomenon of the Zero Moment of Truth, and the importance of being able to control it through proper content and product management. Traditionally, the consumer purchase journey experiences the stimulus (advertisement), followed by the First Moment of Truth (seeing the product on the shelf), then the Second Moment of Truth (buying/experiencing the product). However, with the internet being easily accessible nowadays, and with the consumer trend tending towards conducting online research before purchasing an item, the Zero Moment of Truth is born (when the consumer looks up the product online). Ooi also brought up the topic of merchants operating their own e-store versus operating out of a marketplace, and noted that each has their own place in product and content placement with their own pros and cons. Ooi noted that the key points for consideration when a merchant makes this decision should include the nature of the product, how competitive the landscape is, the availability of marketing expertise to the merchant, the pricing strategy to be employed, market segmentation, the availability of supplier support, the margin structure the merchant would like to see, as well as the response after reading the people and shareholders. Ooi defined product management as “an organisational lifecycle function within a company that deals with the planning, forecasting, and production, or the marketing of a product or products at all stages of the product lifecycle”. Also defined were brand management (the analysis and planning on how a brand is perceived in the market, where developing a good relationship with the target market is essential, and where tangible elements include the product itself, its appearance, price, and packaging, among others) and category management (a retailing and purchase concept where the products bought by an organisation or sold by a retailer is broken down into discrete groups of similar products known as product categories, and is a systematic, disciplined approach to managing a product category as a strategic business unit). Ooi noted that the trio are closely linked, as he stressed the importance for a merchant to know all there is to know about the product’s life cycle, and using that information to present that product at its best. Some advice he gave was that the online advantage comes in the initial stage and the closing stage (Zero and Second Moments of Truth), when compared to the traditional method. Information Ooi notes is pertinent to merchants regarding the product life cycle include knowing who developed the product, the timeframe of the product life cycle, the best stage to generate revenue, the amount of suppliers in the market, the competitive landscape, the size of the target market, and if the suppliers and products are online-friendly. Ooi then shared the results of a survey on product category buying behaviour, which covered items like laptops, makeup, mobile phones, music, medicine, and hotel stays, among others, and discussed the behaviour of each, whether it leaned towards “research online, buy online” or “research online, buy offline”. “If they don’t buy your content, they won’t buy your product”. Those words are exactly why great content management matters, according to Ooi. He noted that e-Commerce websites were not movies, and at the same time are different from other kinds of marketing websites. Content couldn’t just be engaging, and could not just focus on promoting items, but had to attract and hold the interest of the customer, move the consumer from “yes, I’m interested” to “Yes, I want to buy”, and make the actual sale. Ooi then noted the four main processes of a content management system, namely content creation, content management, content publishing, and content presentation, each of which are crucial towards the objective of attracting, holding, converting, and selling to the consumer, before moving on to the presentation principles that should be embodied in any content created. Following that, Ooi covered the key features that should be in the content management system chosen, namely SEO-friendly URLs, simplified user and group management, a group-based permission system, unlimited looks without changing a line of content, an integrated audit log, an integrated file manager with upload capabilities, an admin panel with multi-language support, and minimal server requirements. Ooi then covered the main benefits of content management systems, noting that these systems reduced costs spent on site maintenance, allows for greater growth capacity, increases the flexibility of the site, improves site navigation, allows for a faster turnaround time for new pages or changes, and streamlines the authoring process. After his presentation, Ooi was asked if language was a consideration in content generation, to which he replied that yes it is, but advised that the human touch should remain despite technologies like Google Translate. Language becomes more of a consideration when targeting a certain segment of the market. However, if the target is Malaysia and/or Singapore, English is fine. The guest speaker for the day was Bernard Yap, the former CDO of LogOn.my and experienced e-Commerce industry leader, who went into several tips for product sourcing, as well as general tips for e-Commerce. The very first tip that Yap shared was for merchants to understand what their goal is, or defining their goal if they have not. As an exercise, Yap set the goal of getting to Penang as an example, then proceeded to interact with the attendees over their plans, actions, and methods, taking care to note that the methods have to be in accord with the budget, timeframe, and achievement they want. Yap got the attendees to think about the tools they would need, and noted the myriad of ways that one could get to Penang. “Even walking is a way, though it would take 73 hours,” he noted. 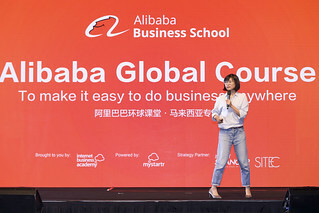 The purpose of the exercise was to demonstrate the clarity a clear mindset and direction could give to planning, according to Yap, who then moved on to connecting the exercise to e-Commerce. As e-merchants, he noted that the goal is success in online selling, with the measurable target being to sell a certain amount within a certain timeframe. Yap then revealed a pro-tip for being successful in online selling, something he calls the PMF, which stands for the “Product-Market Fit”. “The product/market fit means that the merchant is in a good market with a product that can satisfy that market,” noted Yap. This, he adds, is the key to success in online selling, and that, with a fit between the product to the market, the success rate of that business is already 50%. “If you want to be the best, you’ve got to learn from the best. In the words of Pablo Picasso, Good artists copy, great artists steal. Even babies learn how to smile by copying,” noted Yap, who then touched upon several projects on Kickstarter and Indiegogo as examples, while also noting that those platforms also serve as testbeds for idea validation, and a possible source of seed capital. After “learning” from top players, Yap then noted that it was time look at product improvements to overtake the top player. He shared his own experience in 2010, when the transition to micro-sims was just beginning. By predicting the influx of iPhone 4 users, he started selling micro-sim cutters on his own website, eBay, and the Lowyat forum. This allowed him to capitalise on the iPhone craze. The next bit of advice Yap had for attendees was that it was all right for an online business to fail, and that even if an entrepreneur failed fast and failed often, they only needed to succeed once to make it big. Starting fast and failing fast in an online business is also generally less costly than a traditional business, which allows for more attempts. Yap then reminded attendees that for an online business, there are no boundaries in who to sell to, as the internet itself is boundless. It all comes down to the merchant to decide what market they want to target, and where that market is. He even included a comparison of local postal mail and express couriers for those who wished to sell overseas. Yap explained that local postal services tended to be slow, but are usually cheap, while express couriers are the opposite, being fast, but for a price. This was something that the merchant had to factor into their product choice, and whether or not they could target a particular region, market, or country. Of course, Yap noted that there were other challenges involved in starting an online business, such as having a proper landing page, upping the conversion rate, matching up with proper shopping carts and payment gateways, and handling customs and supply chains, among others, not to mention the issues of currency exchange and customer service. This served as a reminder to merchants that there are other aspects to running an online business beyond what he had discussed, and had to be taken into consideration. During the Q&A session, Yap was asked a question on which products are easy to sell on a marketplace, and he responded that it all varies depending on brand, the available market, and the amount of competitors, among other details. An example he gave was that the mobile phone seller industry is a bloodbath at the moment, due to there already being many established players in the field. He advised that it would be better to try doing something that is unique and “your own”, as he said. Another question fielded was on the subject of synchronising SKUs, especially for those startups with no professional team and just starting out. The question was if there was a system or company that Yap recommended to synchronise the SKUs. Yap responded that there were a number of platforms that offered their services tailored to the needs of the merchant. Yap also noted that his own business used a customised variant of an available service.